Stantec provides professional consulting services in engineering, architecture, interior design, landscape architecture, surveying, environmental services, project management, and project economics, along with construction and construction management services across 23 countries, in 6 continents. Committing to ethical business behaviour is, thus, a top priority. 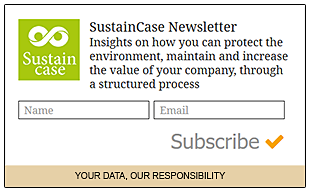 This case study is based on the 2017 Sustainability Report by Stantec published on the Global Reporting Initiative Sustainability Disclosure Database that can be found at this link. Through all case studies we aim to demonstrate what CSR/ ESG/ sustainability reporting done responsibly means. Essentially, it means: a) identifying a company’s most important impacts on the environment, economy and society, and b) measuring, managing and changing. In its 2017 Sustainability Report Stantec identified a range of material issues, such as energy use, emissions, occupational health and safety, diversity and equal opportunity, procurement practices, customer privacy. Among these, adhering to ethical business practices stands out as a key material issue for Stantec. To identify and prioritise material topics Stantec used various tools and processes to ask key stakeholders to focus on their relationship with Stantec, and to identify what sustainability issues mattered most to them. What actions were taken by Stantec to adhere to ethical business practices? Stantec’s Code of Business Conduct Policy explains its expectations for employee behaviour and sets global standards to follow in day-to-day work. All employees, officers, directors and contractors must take Ethics and Code of Business Conduct training once a year. Training topics include ethical behaviour, code of conduct, conflicts of interest, global anti-bribery and anti-corruption, government contracting, harassment and discrimination, privacy, political activities, political and charitable contributions, sponsorships, and social responsibility. Stantec encourages employees to speak up if they notice unethical or unlawful behaviours. 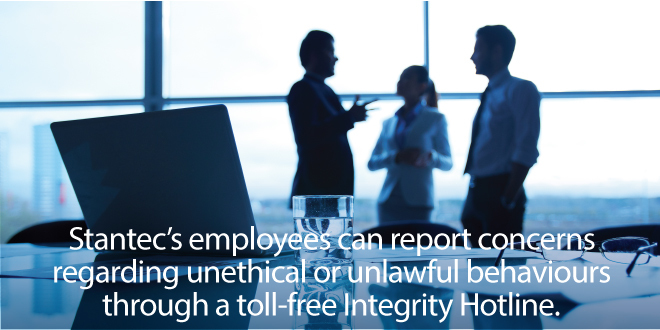 Employees can report concerns confidentially and anonymously through the Company’s toll-free Integrity Hotline (managed by a third party). Stantec does not tolerate retaliation against employees voicing concerns. Stantec employees must avoid conflicts of interest at all times when dealing with current or potential clients, subconsultants, vendors, contractors and competitors. To reduce the risk of corruption, Stantec implements appropriate mitigation strategies: all operations are assessed regularly for conflicts of interest and corruption risk, and the economic and political conditions of the markets Stantec serves are closely monitored. Stantec’s policies on charitable contributions and sponsorships are covered in employee training. Requests for contributions and sponsorships go through a formal approval process, with legal counsel oversight if needed. Stantec does not make political contributions to individual politicians, nor does it reimburse employees who choose to make them. In 2017, Stantec implemented a new Partner Code of Business Conduct programme to minimise the potential for problems within its supply chain. Accordingly, vendors, subcontractors, and partners are asked to apply business practices consistent with Stantec’s standards. Before being awarded work, they have to agree to comply with Stantec’s Partner Code of Business Conduct, which covers, among others, employment practices, health and safety, environment, human rights, discrimination, anti-bribery, intellectual property and privacy. Note to Stantec: With each case study we send out an email requesting a comment on this case study. If you have not received such an email please contact us.